Many people belong, volunteer and affiliate themselves with various types of organizations: political parties, professional associations and societies, non for profit organizations, boards, public and private clubs. Successful motivation and recognition of top performing individuals are many times a priority to a success of organization as a whole. It is also important to choose a gift message with proper meaning and sincerity and to present it in front of the peers. There are various ways to display profound gratitude to those who volunteer their time and efforts to advance the organizations they belong to. Thanking board members for their loyal service and commitment when their service term ends or on an anniversary of their service (5 years, 10 years) has become customary. Crystal Art USA offers the following crystal gifts and awards that are popular as board member gifts. Crystal gavel award features a sculptural design of a crystal gavel set a top of a crystal base, which is personalized with a meaningful message. 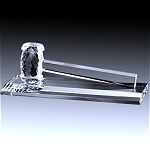 Crystal bookends or crystal book award are also popular as recognition gifts for board members. 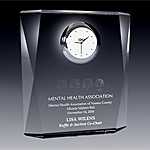 Crystal desktop gifts such as crystal clocks, pen holders or crystal paperweights provide a less expensive alternative to larger crystal awards. Commemorating a successful event, such as an awareness event (Breast Cancer Walk) or a fundraising event for a school or a hospital also provides as successful recognition and motivational technique. 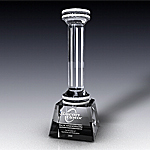 Our crystal plaque awards and crystal obelisks provide the best vehicle for event recognition. Some of most popular awards are the vision plaque, majestic octagon award, prestige plaque, merit award, centurion tower trophy, embassy tower trophy. Many organizations are funded by private donations and contributions. It is important to recognize the generosity of such selfless contributors. Donor plaques and donor awards solidify the bond between the patron and the recipient and promote further generosity on behalf of the benefactor. Corporate sponsors should also be recognized with an appropriate award that bears a message and organizational logo, thus providing additional visibility to the organization at sponsor’s location. While choosing an appropriate donor award, one should consider a classy timeless design that sends a message of gratitude and outmost sincerity. Some of our customers choose from various wall plaques awards that are displayed on walls in a similar fashion of a picture frame. 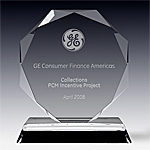 However, most commonly, our customers choose unique and impressive crystal awards which donors and sponsor would not be ashamed to display. Such as our unique crystal pillar award, that sends a message of support and strong foundation that donors provide. Our Soar High award communicates an uplifting message of achieving higher heights of success. Our crystal foundation award symbolizes the cornerstone of establishment that leads to its success. Thanking professionals for volunteering their time and expertise to organizations is also important in promoting good relationships. At speaking engagements it is customary to award presenters with recognition token. Speakers are often gifted with star themed trophies or crystal desktop gifts, such as penholders and crystal clocks.